Remakes are always tricky, especially when it is of a much-acclaimed investigative thriller. However, for Director Sujoy Ghosh, who undisputedly changed the landscape of Bollywood thrillers with his gobsmacking Kahaani in 2012 and intriguing Kahaani 2 – Durga Rani Singh in 2016, it had to be obviously easy. 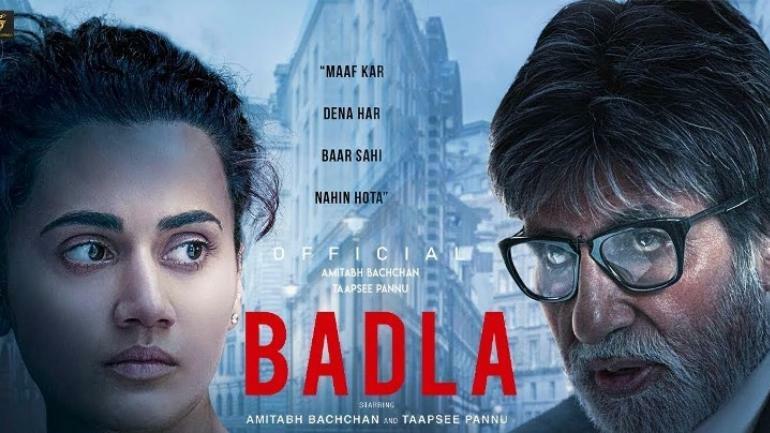 He definitely knows a thing or two about delivering a taut whodunnit, and has done it once again, with an enticing and an edge-of-the-seat mystery thriller – Badla. The plot of the film is simple (or so you will believe). Naina Sethi (Taapsee Pannu) is a young successful businesswoman with a perfect family. Naina’s world turns topsy-turvy when she gets arrested for the murder of her secret lover Arjun (Tony Luke). Her lawyer Jimmy (Manav Kaul) hires prestigious defense attorney, Badal Gupta (Amitabh Bachchan) to defend her, and over the course of one late evening, they work together to find out what actually happened that fateful day, amidst a web of lies. That’s the basic premise of Badla – a revenge drama that is set in a house in United Kingdom and works in flashbacks. If you’ve watched the 2016 courtroom drama Pink, you will have many deja vu moments, but actors Taapsee Pannu and Amitabh Bachchan try hard to recreate their magic. The way Taapsee Pannu switches between various emotions during her conversation with Big B is commendable. On the other hand, Big B’s ‘holding-the-fort’ like gravitas is a highlight. Malayalam actor Tony Luke, who makes his Bollywood debut with this film, is convincing in his role. His struggle with Hindi is evident. Like always, I loved Amrita Singh in the movie. She is surely the director’s surprise package. The actress, who has returned to the big screen after two years, steals the show. Getting to see her play a meaty role is a breath of fresh air. I would specifically like to mention one scene (Spoiler Alert!) when she meets Taapsee at a party, her performance in that particular scene will choke you. I wonder why we don’t see more of her in films. After watching Manav Kaul in 2017 comedy-drama Tumhari Sulu, I feel that the actor has a lot more potential. But in Badla, he was underutilized. He does the bit he was asked to do. The movie is an official remake of Spanish film The Invisible Guest. 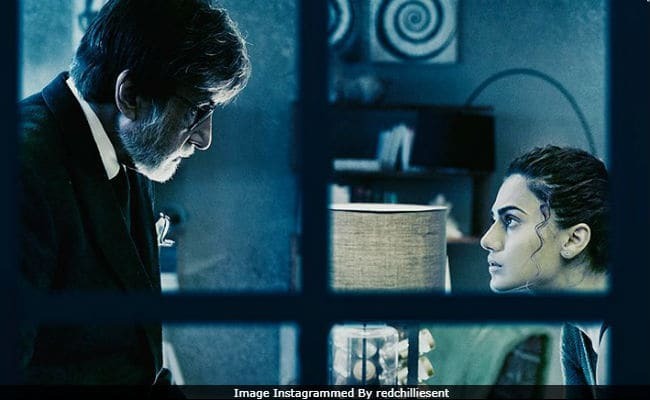 Badla stays largely truthful to the source material, brilliantly adapting for the Indian audience. It often happens that when a filmmaker remakes or adapts a movie, the original one loses its soul and the remade version turns out to be a caricature of the original. But, that’s not the case with Badla. Badla is a perfect example of how to adapt/remake a film. The film is fast-paced, sharply edited, backed by a strong narrative and good performances. The intense background score, supports the film beautifully and makes it a winning thriller-drama that it is. Maaf kar dena, har baar sahi nahi hota. Sach wahi hota hai, jo saabit kiya ja sake. The twists and turns in the movie will often leave you confused. At some point, the story will seem to be becoming very obvious. But you will be proven wrong. It will make you think till the end of the movie or even a couple of days later (like me;)). While I love the climax and the revelation, it may seem a bit far-fetched but what pulls it off is the fantastic… shhh… wait… that’s a spoiler. So, let’s just leave it here. All in all, Badla is high on drama, twists and turns. The two-hour revenge drama keeps you on the edge of the seat with every revelation knocking you off your feet. Watch Badla as a standalone film without any reference to the original, it will entertain and surprise you. Have you watched Badla yet? Tell us what you thought about the movie and our review in the comments section! very well written! the movie has been on my Wishlist and I guess am gonna make a visit soon! Great story. Noticed only 2 discrepancies. Visitors to a posh building will be announced by the door man. But AB wasn’t. Also when a car is towed, somebody has to be at the wheels of towed car. But not in the movie!